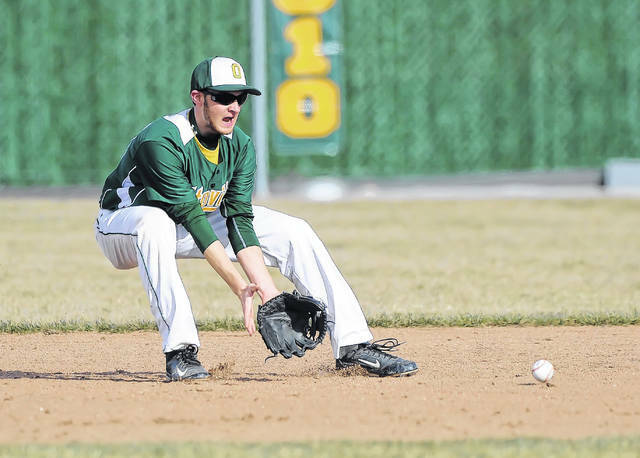 Ottoville’s Clayton Schnipke fields a ground ball against during Friday game against Elida at Ottoville High School. 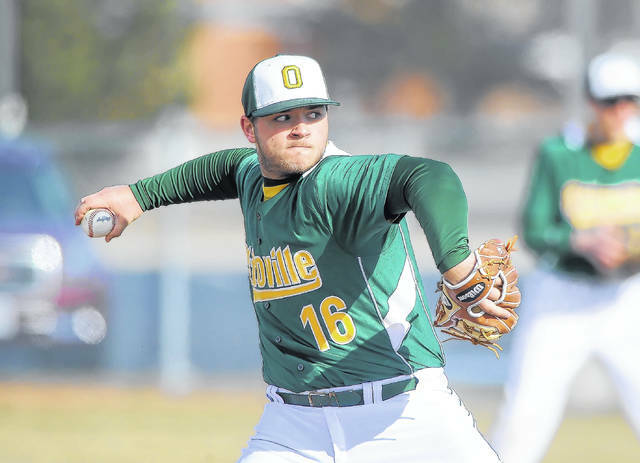 Ottoville’s Zane Martin pitches against Elida during Friday’s game at Ottoville High School. Elida’s Luke Burger pitches against Ottoville during Friday’s game at Ottoville High School. Elida’s Drew Biglow dives back to first base as Ottoville’s Dylan Kemper receives the throw during Friday’s game at Ottoville High School. Elida’s Luke Burger dives for a fly ball during Friday’s game against Ottoville at Ottoville High School. 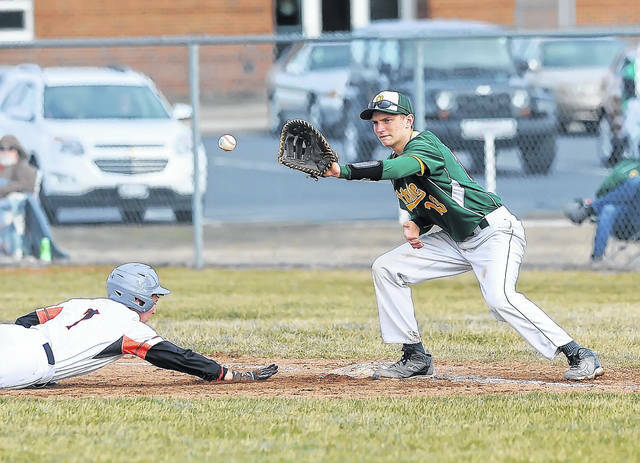 OTTOVILLE — A Josh Thorbahn sacrifice fly brought in the winning run in the bottom of the seventh as the host Big Green defeated Elida 2-1 in baseball Friday. Thorbahn also got the win in relief, joining starter Zane Martin in allowing no hits. Thorbahn went 2 2/3 innings, allowing no hits or runs and one walk while striking out five. Martin went 4 1/3 innings, allowing an unearned run, walking four and striking out four. 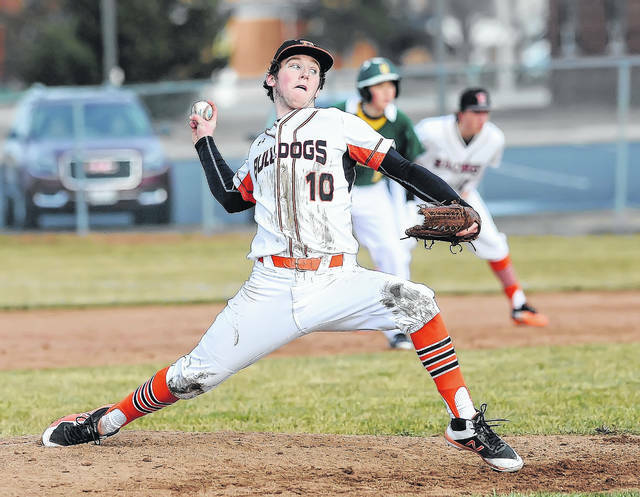 Elida starter Josh Howard went 5 1/3 innings, allowing one hit, one run and four walks while striking out six. KALIDA — Winning pitcher Kevin Hamburg went seven innings, allowing four hits and a walk while striking out eight. Kalida’s Trevor Lambert had a single, double and four RBI. 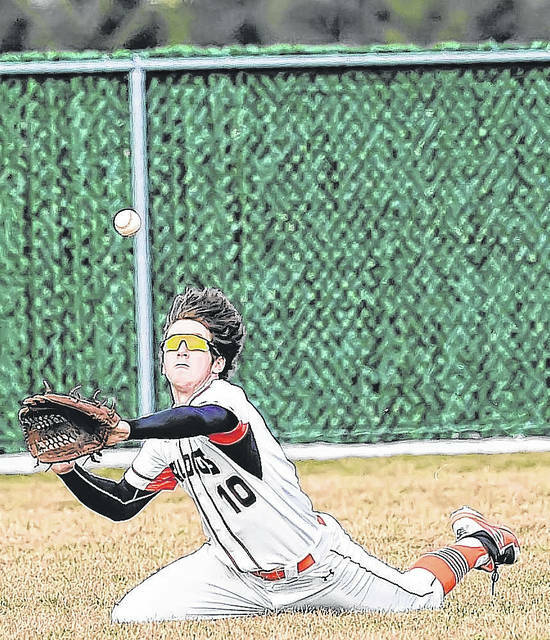 Isaac Stall had two hits for P-G.
BLUFFTON — Singles player Andrew Boyer and the doubles teams of Hayden Robinson and Taj Chahal and Alex Stephens and Mason Bloom won for Kenton. Justin Haggard and Drew Wilson won at singles for Bluffton. ADA — Singles players Zach Beaschler, Cade Mullins and Miranda Wills all won for the host Bulldogs. The doubles teams of Andrew Vogel and David Keller and Mat Kawalec and Evan Tennant won for the Roughriders. DOLA — The Polar Bears scored the winning run in the bottom of the ninth after Arcadia scored twice in the top of the inning to tie the game at 10. Shelby Alloway, Cassidy Deckling and Haylei Pees each had three hits for Hardin Northern. One of Deckling’s hits was a double and Pees also had an RBI. Haylie Spearman had a single, double and three RBI, Quinn Stewart-Evans had a single, double and two RBI and Madison Robson had two hits and two RBI also for the Polar Bears (1-0). BATH TOWNSHIP — The doubleheader between Springfield Shawnee and Bath today will be played at Bath beginning at 11 a.m.
TOLEDO — The University of Northwestern Ohio improved to 20-14 overall and 13-3 in the Wolverine-Hoosier Athletic Conference with an 11-4, 8-7 sweep against Lourdes University. In the 11-4 win, Felix Correa had two hits, including a home run, and five RBI, and Junior Gomez and Jack Barrie each had two hits and two RBI for the Racers. One of Barrie’s hits was a double. In the 8-7 victory, Barrie homered and Myles Miller had two hits. RICHMOND, Ind. — Adam Duncan had three hits and two RBI, Jacob Latkofsky had two hits and two RBI and Reid Ruhl and Lenny Winiarski each had two hits for Bluffton (12-6) in its Heartland Collegiate Athletic Conference opener. The second game ended after deadline.